Consumable Gifts are ideal for the special someone who has everything! Do you have a of of “stuff” and need more like you need a hole in your head? When someone asks you for a gift list, do you look at them like a deer in the headlights? Have you been told by your: mother, grandmother, father, grandfather, siblings or other relatives “Don’t buy me anything”, but you feel “funny” arriving empty handed? • Your time: Lunches, dinner, day trip, a movie or donate a few hours for household repairs or painting, a day of babysitting or adult care so the caregiver or parent can run errands, the gift of our time is the most precious we can give. • Housecleaning Services: Whether a weekly service gift, monthly, or one time cleaning gift, many people will appreciate the luxury of having someone else clean their home. • Lawn Care: We give this to my grandfather every year. He hasn’t been able to take care of his lawn for years, so we found and hired a service to do it for him. This makes him happy, and we are thrilled to give him such a worthwhile gift! • Flowers or Plants: If your special someone isn’t allergic, a flower of the month club, a one time bouquet, bulbs for the garden or an indoor plant might be just the thing to brighten their day! • Birdseed: Is a Bird watcher someone you give a gift to? Do they feed the cardinals and blue jays from their back porch? Birdseed is no longer inexpensive, and suet cakes or special feed might be most welcome. • Fruit of the Month Club: a fruit basket, or an edible arrangement! All lovely ideas for getting fruit to your favorite people. • Livestock: Yeah it sounds odd, but it really is a great gift. • A CSA Share: Community Supported Agriculture is a wonderful way to give local produce. • Wine, Beer or Liqueur: Whether to bring to a holiday dinner, or give as a gift, a nice bottle of wine, a craft beer or a favorite liquor or liqueur can be a great idea! • Memberships: A gym, the zoo, the science museum the local spa! Memberships to various organizations can motivate and entertain the entire year. • Postage stamps: Not everyone pays their bills online, and some people still send cards, letters and rebates through the postal service. When giving a service present or donation, a note in a card is a wonderful way to let the recipient know what you did for them. Do you ask for, or give, consumable gifts? 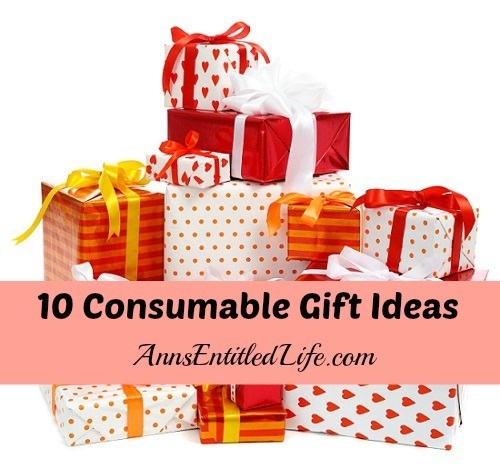 What great consumable gift idea do you have? Great ideas!! I love the one re: gift of time. That’s what means the most. 🙂 I am using that one a lot this Christmas. My favorites gifts to receive are renewals on our memberships and gift cards to places like the drive-in. Even if money is tight, we still have plenty to do all year long. I am the baker in our families so for Christmas we give extended family tins filled with cookies and something small like an ornament. A few years ago I convinced my in-laws that since none of the adults needed any more stuff that we should just do a secret Santa every year to cut down on the gift giving and increase the time together. This year I am going to propose that we cut out the secret Santa and instead “adopt” a family in need and give the gifts to them. Movie tickets, restaurant gift cards, & offering to babysit…date nights are too few and far between these days! Babysitting … priceless! Not only does it save costs, it is with a trusted relative. Excellent ideas, Lisa! This list is great. Thanks for putting it together! I had to come up with consumables as gifts for my four nieces once. I knew my oldest niece (10) had an Easy Bake Oven, so I made her a bag of individually packaged mixes, each with their own instructions on printed index cards. For Kaitlyn (8), I made a “Katie’s Koco Making Kit” with individual ingredients in disposable plastic containers along with the corresponding measuring cups and spoons from an old set that I had that was missing some. I also included a small whisk from Pampered Chef that had been a door prize at a party. For the six year old, I found a collection of kids magazines (Nick, Jr, perhaps?) that were extremely interactive. I looked through each issue and included what ever items were needed, like four metal fasteners, three pennies, a dice, a glue stick, scissors and such. I made a cute box with a handle for them out of a large cereal box and duct tape. For the “baby” (4) who totally loves to play dress up, I made three “paper” (card-stock and various other materials) purses (these took the most time and they were awesomely cute!) and filled them with little disposable items, like old key rings, empty makeup compacts, sample lotions, and the like. It was a challenge, but all four girls really liked their gifts. Wow those are creative, Stephanie! Awesome ideas. So you are saying that the stamps I give my mother every month should be saved for Christmas or maybe a birthday? I like that idea lol! I want the housecleaning for myself and everyone in my house! Don’t be selfish, give your mom the stamps for both, T! Those are all great ideas Ann. I have used many of them. Not only are stamps a good idea, for some older people a box of assorted cards is nice if they like to send them out. If you give them a box of cards and some stamps, they are all set without leaving home. I have given Omaha steaks too. Not only is it good quality, you can gift several meals in one box. I recently told my kids if they are stumped for a gift for me, I will always be happy to Amazon gc’s. They sell everything you could want! I’ve sent my parents Maple Syrup & Ohio apples.. something they’ll never find in Texas..
My mom hates giving & receiving presents and she told me that if I had to send her something, she’d rather have something like the dehydrated Olive Oil & Salt Cherry Tomatoes I make.. This year I bought bulbs for Saffron Crocus & planted them.. If they’ll bloom before the ice gets here, I plan to send her saffron & dehydrated cherry tomatoes for Christmas.. She’ll love that.. Guaranteed. I personally like anything homemade..
Every year I make a double batch of homemade Butter Caramels. The recipe (Land O Lakes Aunt Emily’s Soft Caramels) is SO easy to make and for about $10 worth of simple ingredients and a few treat bag supplies I can make pretty little gift bags of caramels for about 20 people and still have plenty left over for my own family to eat. People love these because they’re homemade, decadent and very special – not something you eat every day. I also love getting inexpensive holiday nesting boxes and filling them with my own special, homemade treats and making a “Tower of Treats” (just like Henry and David but at 10% of the price!) for gift giving. Nesting box towers are a great way to present many types of consumable gifts. Merry Christmas! One of my favorite gifts I have received is steaks from my auntie and uncle. Their farm isn’t organic, but the cattle is free range and hormone free. I recently took my god daughter on a day trip for her birthday, which she absolutely loved. I have been working like mad and haven’t had much time to spend with her, so it made her extremely happy for the two of us to go on a small trip together.